Greg began his Real Estate Career in 1988 with his Agents Designation and then furthered his education with his Brokers Designation In 1990. After 15 years and multiple EREB, Provincial and National awards in residential sales, he joined CentreCorp to pursue commercial leasing and development opportunities until the company was restructured in 2005. In 2005 Greg once again joined the Realtors Association of Edmonton and Re/Max Real Estate to continue residential & commercial real estate sales, development and leasing. Greg was elected to the Realtors Association of Edmonton Board of Directors for 2 terms from 2010 to 2015. 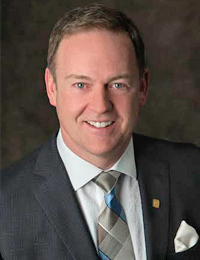 He was elected Vice President (2012), President Elect (2013) and President of the Realtors Association of Edmonton in 2014 and Past President in 2015. Greg served on numerous committee’s including Audit (2013-2015), Chair (2014) and Co-Chair (2015). Chaired (2012) and co-chaired (2011) the Arbitration and Professional Standards Committee. Chaired the Marketing Committee (2015), Chaired the Commercial Committee (2010). He has also served as Director Liaison for the REALTORS® Community Foundation Board of Governors. (2010). Greg served multiple years on the Re/Max General Advertising Committee and Chaired the same (2009). Greg’s beliefs in integrity, honesty and determination, have led him down a very enriched and gratifying path, one which has also allowed him to give back in many ways. Greg is very proud of his association with the Children’s Miracle Network, to which he donates a portion of every single transaction he completes. The Canadian Cancer Society is another cause that is very dear to Greg’s heart. He is also an active supporter of the Realtor Community Foundation “We Care” program and also donates a portion of every transaction to this wonderful cause. Greg has been awarded the top contributor award for both charities for more than 2 decades and considers these two awards the crown of his career achievements. The Re/Max organization has awarded Greg the “Hall of Fame Award”, the “Lifetime Achievement Award”, the “Spirit of the West Award” and with his amazing contributions and support for the above Greg was awarded the “Re/Max International Special Service Award” in Las Vegas in 2015. Greg loves Hockey, travel, golf and is an avid sports enthusiast and has been an Edmonton Oiler and Eskimo season ticket holder since the early 1980's. He currently plays hockey year round and has played in multiple senior men's tournaments in Europe and North America. He proudly supports and plays annually in the Alzheimer’s Pro-Am Hockey Tournament in Edmonton raising money to help find a cure for Alzheimer’s and Dementia with a little help from a few famous past NHL players. When Greg has some down time he likes to spend time with family and friends and especially the newest member of his team, his puppy “Rocky”. Greg is also a classic car enthusiast and loves to hit the road and relax on his prized Screaming Eagle Harley Davidson. Bretton received his Real Estate License in January of 2018. His desire to help buyers find their dream homes coupled with a strong worth ethic and drive makes him a solid addition to the Greg Steele Real Estate team. Born and raised in Edmonton, Bretton has a fondness for the City and wants to help current and future Edmontonians through the process of buying and selling homes. Bretton was recently elected to serve on the Board of Govenors for the REALTORS® Community Foundation. The Foundation is supported by REALTORS® who generate fundraisers and donate hundreds of volunteer hours each year! Bretton is looking forward to giving back to the community and providing leadership in these ventures.